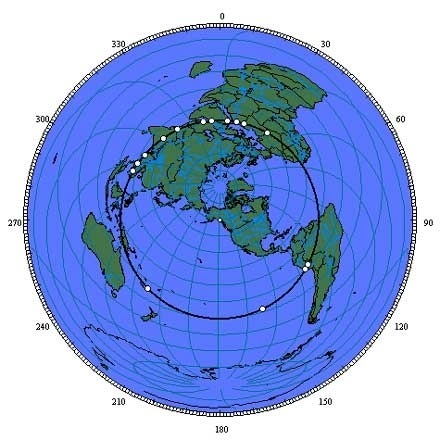 Mindblowing Alien Discoveries Perfectly Aligned Forming A Straight Line Around The Earth! These sites are owned by UNESCO which stands for,United Nations Educational, Scientific and Cultural Organization. Basically, owned by the United Nations to protect those sites seen as special to the world and our culture. They basically own all the sites you could imagine worldwide. However, some of the more well regarded culturally and that hold important significance are those you have probably already heard about. Easter Island, Nazca Lines, Machu Picchu, Tassili n’Ajjer, Persepolis, Khajuraho Group of Monuments, The Oasis at Siwa, The Pyramids of Giza and Mohenjo Daro. Many questions come to mind and this is perfectly normal. We have heard about a mysterious grid cloaking this planet. A couple of scientists, including Nikola Tesla, were obsessed with different location on this mysterious grid. They believed these locations are extremely potent with high energy fields. Some of the paintings found at this site have bizarre depictions of what appear to be spacemen wearing suits, visors, and helmets. Resembling modern day astronauts. Reading into the background of west African tribe The Dogon, known for legends that speak of being guided to the area from another part of Africa, by fish gods called the Nommo who came in huge ships from the sky. Intentionally moved for these people to settle? Dating back to 2,600BCE and estimated to be one of the biggest cites at its time, housing thousands of citizens, using sophisticated plumping throughout the city grounds with certain areas seeming to provide heated water supply. Some of the stranger history is that in 1927, excavations of the site found skeletons dotted all over the streets holding hands. Frozen in time, as if almost instantly taken. It appears from archaeologists findings that some great force swept right through the city and the residents had no warning. What kind of power in those early years could cause such devastation? Finally, the well-known and well documented site of Giza. Where such hieroglyphs have been found. Such as the following. Leaving archaeologists very much baffled when it comes to understanding why and how these hieroglyphs could depict what would be deemed modern day technology. Was there a need to note down their advancements in case of such a tragic event like Mohenjo Daro that could occur again? The collection of sites, perfectly aligned, detailing some of the most important historical places on our earth, all correlating in stories, depictions, history of sudden disappearances of a once beautiful thriving empire. That by some miracle of chance, become aligned on a global scale.